We have all ratted our hair and then “smoothed it out” only to find it has all come out and is totally flat! Tune in to this video for the tips and tricks of bigass hair. Prom season is such an exciting time. Dress shopping, shoes, jewelry, hot dates. Please- do not forget the hair! I am seeing a disturbing trend in prom seasons lately… Flat regular hair! Why? Why spend so much money on your dress and accessories and then brush your hair as if you are off to home economics class on any given Thursday? I don’t understand! You, as a young woman, have a responsibility to look your very best on this important night. You have boy’s heads to turn. You have classmates to make jealous. You have a reputation to establish, or uphold! Now is not the time for humble beauty and humility. Now is the time TO SLAY!!! Trust me, those head cheerleaders are covering all the bases, and so should you my lovelies. Natural beauty? Great. Leave it for P.E. class. This is PROM! Class, style, razzmatazz and great hair will win you the most attention every time. p.s- don’t wear a strapless dress if you think you will be tugging on it all night. It’s not worth it. 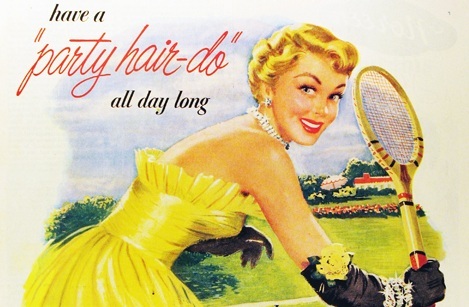 Are you suffering from the effects of dry winter hair? Busy during the holidays with no time in between work and events to even change clothing? Tune in for advice on how to traverse all your holiday obstacles while looking and feeling completely fabulous! p.s- If you are cooking a Christmas turkey, brine it overnight first. This keeps it moist and juicy. Its video time! Halloween hair color is something we get asked a lot about. We tested three colors to see what is what! p.s- want those jack-o-lanterns to last? Carve them just a coupe of days before, they are extremely perishable!